Treiton and his family would like to thank everyone who donated and participated in the fundraising events held on his behalf. We greatly appreciate everyone's prayers and words of hope to get us through this tough time. We have a long tough road ahead and we hope you continue to keep us in your thoughts and prayers. 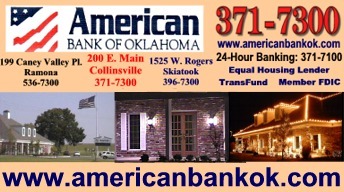 We would also like to extend a special thanks to Rick's Custom Processing for all the delicious hot dogs and turkey legs, Sonic Drive In for all the ice to keep the drinks cold, and the City of Collinsville for allowing us to use the facilities and helping us get the word out, we would not have been able to get this done with out all of you! Thank you so much and God Bless You! Also, Congratulations to Farrah Roth, the winner of the autographed OU sweatshirt. A King, Queen and Princess will be selected based on horsemanship, personal interview, stage presence, public speaking and impromptu questions. 2007 Membership dues must accompany application. $50.00 entry fee and a minimum sales requirement to be eligible. King & Queen contestants must be 13 years old, or older, on date of contest. Princess contestants must be 12 years old, or younger, on date of contest. Winners will receive a saddle, crown, sash, and belt buckle. Awards will be given in other categories. The contest will be held on Saturday, October 28th, 2006. 6 years old and younger may participate as Sweethearts & Buckaroos! Participants must be members of the CVRUC by October 1st, 2006. There is a minimum of sales to be eligible for awards. Dr. Babbitt mentioned at the Chamber of Commerce meeting last week that 900 kids participated in the summer reading program at the Collinsville Library this summer. Susan also said the builing material for the animal shelter should arrive within about 4 weeks. Planning for Collinsville's Future -- The Comprensive Plan Steering Committee continues to meet and study options for long range plans for Collinsville. They last met at City Hall on September 6th, 2006 and saw an INCOG presentation on accident counts at various intersections and simulation results with changes to the stoplights on Main in anticipation of increased traffic after improvements at the S-Curve. The 2000-2005 accident counts showed 5th & Main with the most accidents (27) and Broadway & 19th (S-Curve) 2nd with 26. The 3 stop light intersections in downtown each had 12 accidents in that period.